Vineyard / Origin: This Pinot Noir thrives in our hillside vineyards at Mazon. The vines are approximately 30 years old. Soil: A mixture of clay, lime and porphyry. Winemaking: 75 percent of the grapes are de-stemmed, while the remaining 25 percent go whole into the fermentation tanks. Fermentation with the skins lasts 11 days; during this phase the solid parts are kept loosely submerged in the must by pumping over to keep them moist, and pushing them down. Maturation: The Pinot Noir Riserva is matured for one year in small oak casks, after which a homogeneous blend is made and the wine matured for a further six months in traditional oak barrels followed by 12 months in bottle before release. Description: In colour it is deep ruby-garnet with a typical aroma of undergrowth, small berry fruits and black cherry - mellow, sweet and inviting. On the palate it is warm, harmonious and well-knit, round and rich in complexities, firm though elegant, broad and velvety, enveloping with the grace and refinement of a truly international wine which will become even more impressive after a further one to two years in bottle. Food Choices: Red meats, lamb, poultry, game, and venison. "Falstaff Magazin" has rated the wine "J. Hofstatter Mazon Riserva Pinot Nero - Blauburgunder Alto Adige, Trentino-Alto Adige, Italy" the vintage 2012 on 23.06.2015 with 89 of 100 points. "Falstaff Magazin" has rated the wine "J. Hofstatter Mazon Riserva Pinot Nero - Blauburgunder Alto Adige, Trentino-Alto Adige, Italy" the vintage 2011 on 24.06.2014 with 87 of 100 points. "Falstaff Magazin" has rated the wine "J. Hofstatter Mazon Riserva Pinot Nero - Blauburgunder Alto Adige, Trentino-Alto Adige, Italy" the vintage 2010 on 25.06.2013 with 88 of 100 points. "Falstaff Magazin" has rated the wine "J. Hofstatter Mazon Riserva Pinot Nero - Blauburgunder Alto Adige, Trentino-Alto Adige, Italy" the vintage 2008 on 08.07.2010 with 88 of 100 points. "CellarTracker" has rated the wine "J. Hofstatter Mazon Riserva Pinot Nero - Blauburgunder Alto Adige, Trentino-Alto Adige, Italy" the vintage 2012 with 93 of 100 points. 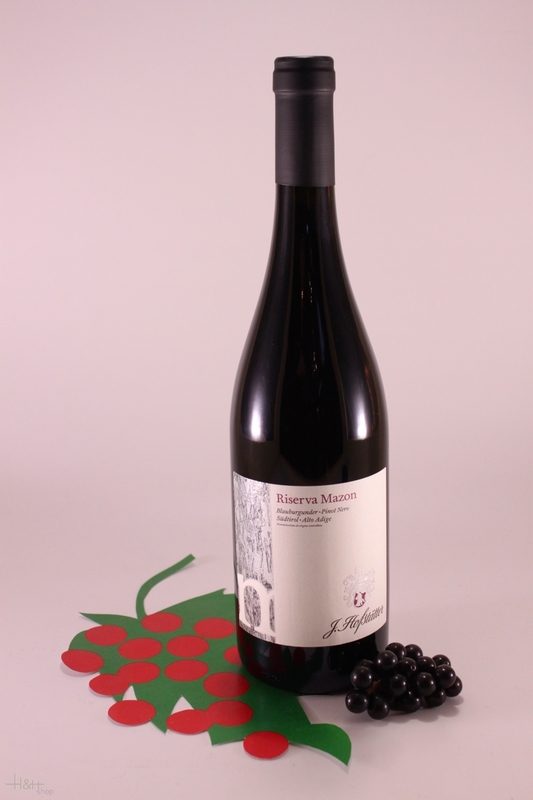 "CellarTracker" has rated the wine "J. Hofstatter Mazon Riserva Pinot Nero - Blauburgunder Alto Adige, Trentino-Alto Adige, Italy" the vintage 2009 with 90 of 100 points. "CellarTracker" has rated the wine "J. Hofstatter Mazon Riserva Pinot Nero - Blauburgunder Alto Adige, Trentino-Alto Adige, Italy" the vintage 2008 with 89 of 100 points. "CellarTracker" has rated the wine "J. Hofstatter Mazon Riserva Pinot Nero - Blauburgunder Alto Adige, Trentino-Alto Adige, Italy" the vintage 2011 with 89 of 100 points.